Unlike some other flavors, I haven’t seen it tried out in any dishes or desserts besides the normal hot drink. And I’m sure everyone I know is tired of me telling them they “have to try this weird hot yellow milk drink! It’ll change your life!“. Generally, unless I make them a cup, I can pretty much guarantee they’re not going to try it out for themselves. 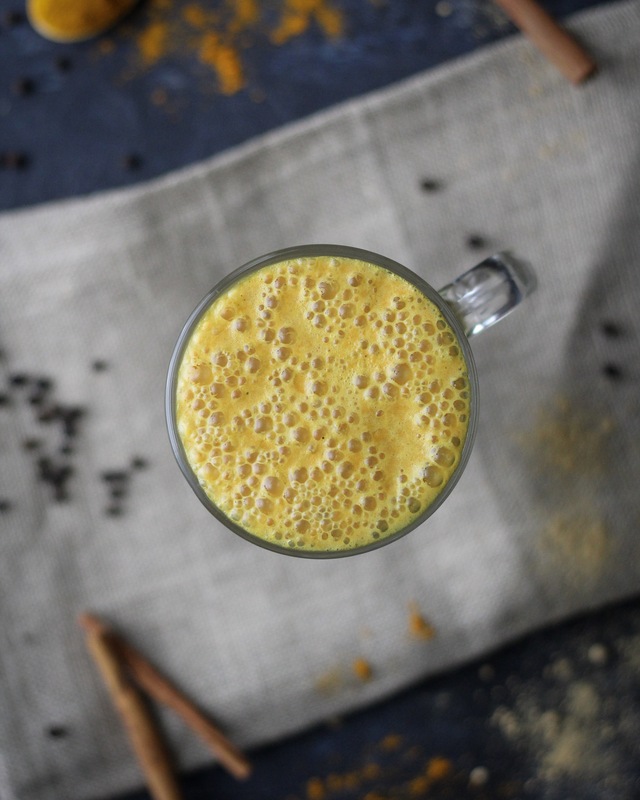 How can I make Golden Milk more accessible to people who aren’t down? 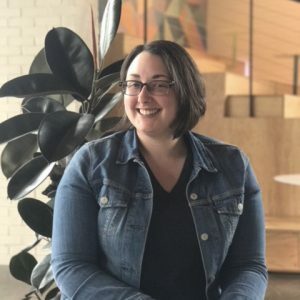 And what can I cook that captures the delicious, spicy, hygge-in-a-cup flavor? Enter this Golden Milk Loaf Cake: a beautiful balance of slightly sweet and savory, with the warm flavors of turmeric, ginger, cinnamon, pepper, and nutmeg. Everybody loves cake. I was honestly a little shocked when recipe testing how much this cake tastes exactly like a steaming mug of creamy, rich, and fragrant Golden Milk. 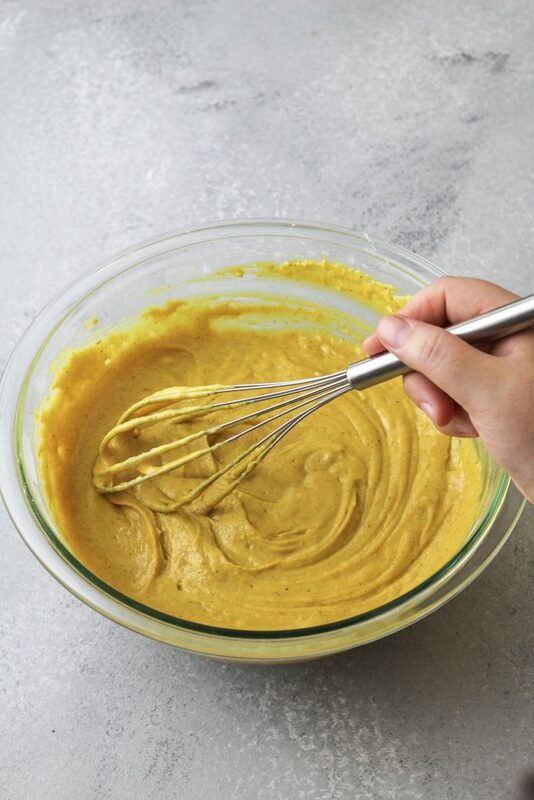 This recipe starts out with a super concentrated version of a turmeric latte: Melted butter mixed with spices and heated until fragrant, then mixed with a vegan ‘buttermilk’ for richer flavor when baking. Everything else comes together as a standard cake recipe. Cream the butter and sugar, add liquid, add flour, whisk, pour, and bake! 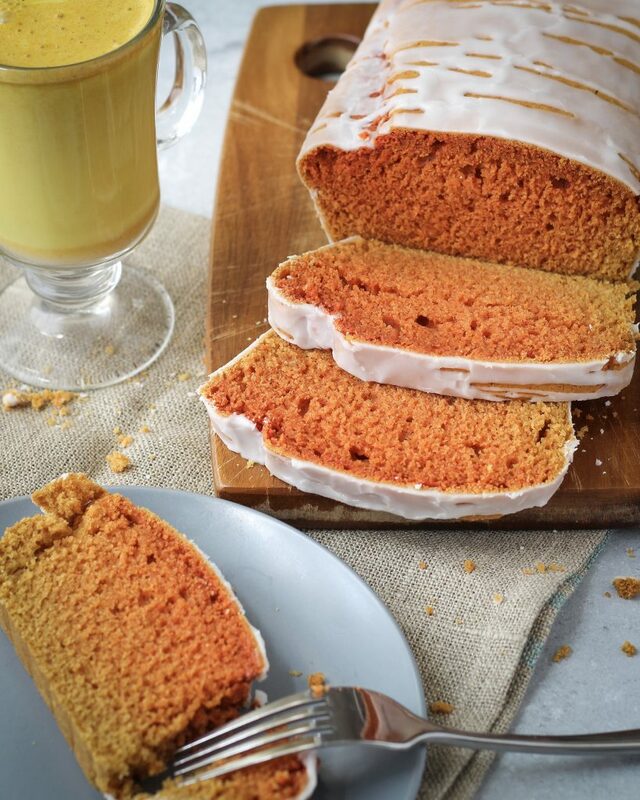 This Golden Milk Loaf Cake is sweet, but not TOO sweet. 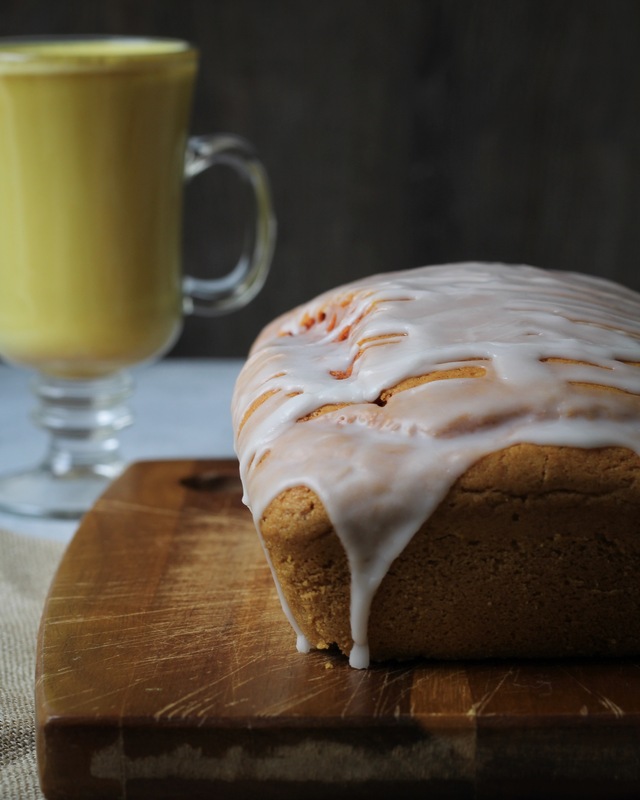 It’s perfect as-is, accompanied with some strong tea or coffee for breakfast, but even better with a simple water icing glaze on top as a dessert cake. Why did the cake turn red?? I was very curious about this immediately after baking; I could see in the split on top of the loaf a pinkish-red color, and I had no idea why my bright beautiful golden batter turned red-orange! Turns out it has to do with the colors and composition of turmeric root. It has a yellow pigment (xanthophyll) and a red-orange pigment (carotene). 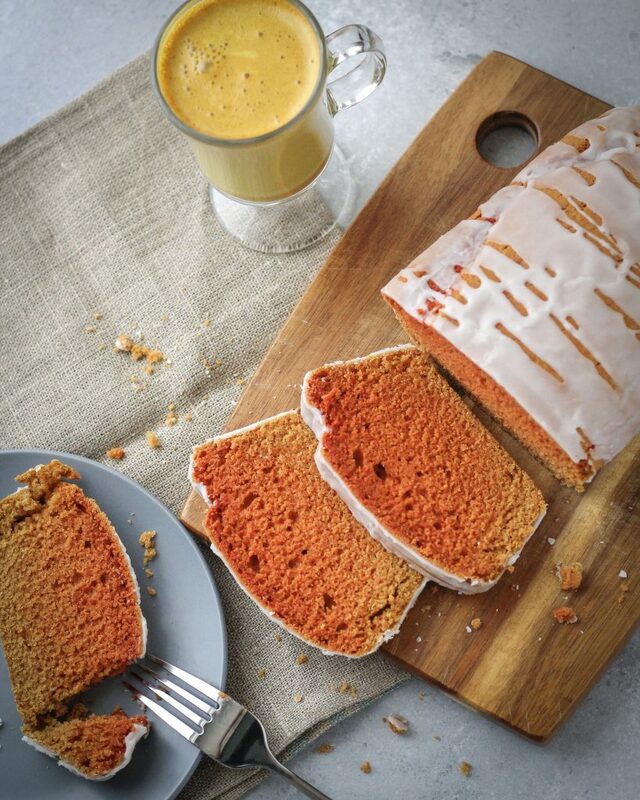 Golden Milk/Turmeric Latte flavors in cake form! 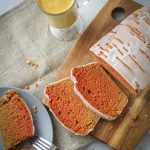 A smooth and creamy loaf cake with mellow notes of turmeric, ginger, and cinnamon, just sweet enough for dessert or accompanied with a cup of strong tea or coffee. Preheat oven to 350°. Line a 9x5 loaf pan with parchment paper. In a small pan, melt 1 tbs butter over medium heat. Once melted, add turmeric, ginger, cinnamon, black pepper, and nutmeg. Stir and heat until combined with butter and spices are fragrant, about 30 seconds to 1 minute. Add milk and vinegar mixture and whisk together until milk is well blended with spices; milk should be warm to touch and slightly steaming, but not too hot. This should take about 1 to 1 1/2 minutes. Set aside to cool. In a medium bowl, mix together flour, cornstarch, baking powder, baking soda, and salt. Add cooled milk mixture to creamed butter and sugar. Mix until combined. Slowly add flour mixture to wet mixture, stirring until combined and there are no visible flour lumps. Pour into prepared loaf pan. Bake for 55 - 60 minutes, until toothpick inserted into center comes out clean. - This creates a kind of curdled buttermilk! Great for vegan biscuits too. -Super important that your butter is room temperature for this step, in order to cream + fluff by hand! I usually use a fork, and it takes about 2-3 minutes. -Quick Water Icing Glaze: Take 3/4 cup powdered sugar, add a scant 1 - 2 tbs cold water. Mix until lumps are dissolved. Start with less water, then slowly add just a small amount until icing reaches desired thickness. You want it to be fairly thick, but pourable. Drizzle or pour over top of cooled cake. Let sit at room temperature until glaze dries. This looks great! Wondering if I can sub coconut oil for the butter to make it vegan. I have not tried a coconut oil substitution personally, but imagine it would work perfectly for mixing the spices in Step 2, but I’m not 100% sure how it would work for the rest! If you try, please let me know! Just as an FYI, all ingredients and recipes on my page are vegan!